Each month we will seek donors to purchase a new title for the Law Library. Here is our Wish List for the month of April. Growing our collection is about so much more than a single book—it is a living demonstration of how the Library expands the public’s access to justice and provides legal practitioners with the tools they need to represent members of our local community. Please see our Donation Guide for more ways to support the Law Library. The Trial Lawyer: What It Takes to Win, 2nd ed. Thank you to James Michel for generously donating John Lennon vs. The USA: The Inside Story of the Most Bitterly Contested and Influential Deportation Case in United States History, part of our August 2018 Book Drive. Thank you to Brenna Moorhead for generously donating Dred Scott v. Sandford: Opinions and Contemporary Commentary, from our May 2018 Book Drive. Categories: Books and Films, Resources | Tags: Book Drive, Criminal Law, Donation, Law Practice Management Collection, Legal Technology, Mental Health, Resources | Permalink. These amazing chronicles enable one to re-live the nation’s three-year state of political paralysis through the avalanche of motions, briefs, subpoenas, and other legal instruments that came to define the Nixon presidency, and offers Library patrons the opportunity to consider what may lay ahead regarding current political developments. The set is on reserve and may be viewed in the Library on request. Categories: Books and Films, Resources | Tags: Impeachment, Nixon, Presidents' Day, Resources | Permalink. You don’t have to be a criminal defense attorney to be interested in criminal law. From the early crime pamphlets published by the hundreds starting in the 1500s, to the lurid crime journalism of the Victorian penny press, the public’s appetite for sensational crime stories has been ever-present and insatiable. And thanks to recent and current books, shows, and podcasts, such as I’ll Be Gone in the Dark by Michelle McNamara (about the Golden State Killer) and the multi-season Serial podcast, true crime remains one of the most popular genres across all multimedia platforms. While knowing all the ins and outs of criminal law isn’t necessary to enjoy the genre, understanding the basic workings of our criminal justice system is essential for an informed member of society. Criminal law covers federal and state laws which make certain behaviors and actions crimes, punishable by either imprisonment or fines. 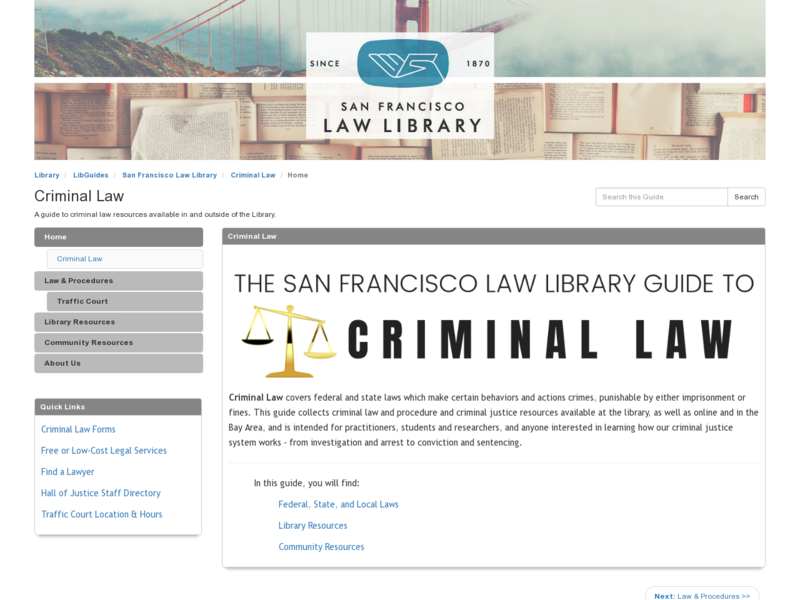 Our newest LibGuide, The San Francisco Law Library Guide to Criminal Law, collects criminal law, criminal procedure, and criminal justice resources available at the library, as well as online and in the Bay Area. Inside you’ll find links to basic criminal law information, federal, state, and local codes, a list of our criminal law print collection, resources for finding a lawyer or free or low-cost legal services, and much more. This guide is intended for practitioners, students and researchers, and anyone interested in learning how our criminal justice system works (whether stemming from an interest in the true crime genre or not) — from investigation and arrest to conviction and sentencing. As with all of our LibGuides, we will keep this guide updated so be sure to check back in. So give the gift of knowledge this holiday season by sharing the library’s Criminal Law guide! Categories: Resources | Tags: Criminal Justice, Criminal Law, LibGuides, Resources, True Crime | Permalink. Each month we will seek donors to purchase a new title for the Law Library. Here is our Wish List for the month of December. Growing our collection is about so much more than a single book—it is a living demonstration of how the Library expands the public’s access to justice and provides legal practitioners with the tools they need to represent members of our local community. Please see our Donation Guide for more ways to support the Law Library. We would welcome a partial contribution toward the purchase of this book! Categories: Books and Films, Resources | Tags: Blockchain, Book Drive, Damages, Donation, LGBTQ, Personal Injury, Resources | Permalink.